Long ago in the distant land of 1998, Disney channel released a made-for-tv movie called Halloweentown that became a sort of low-key cult classic. Personally I can't remember a whole lot about this movie, but its real-world filming location of St. Helens, Oregon has never forgotten...and it turns out to not be all that far a drive from our home here in Portland. We wound up visiting St. Helens with our friend Batscoundrelwhile I was slightly sick and kind of sleep deprived, so we weren't there terribly long and didn't go on any of their bus tours, but the whole little town - and it is adorably little, unlike some towns that come out more oppressively little - seemed to be participating in Halloween to at least some degree, with every store window at least presenting a few pumpkins or skeletons, and some completely decked out in displays like these! Still, cutting our exploration short after a couple of hours, this is going to be kind of a sparse and fairly mild article, at least until I freak out over a hunk of plastic in just a few short entries. Don't skip ahead! Let things escalate naturally!! 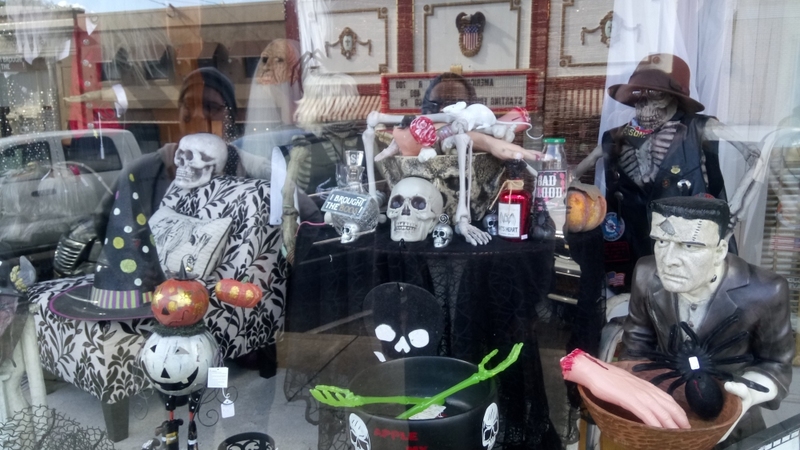 One store was guarded over by a couple of short, rubber ghouls I do not recognize at all, and it's possible some of these decorations are decades old, wheeled out from attics and storage units who knows how many times by now. These two seem like they might be pretty opinionated about this pumpkin. Blue ghoul looks pretty enthused, but I feel like he might be enthusiastically heckling how bumpy this particular pumpkin is. Maybe that's just what these two do. 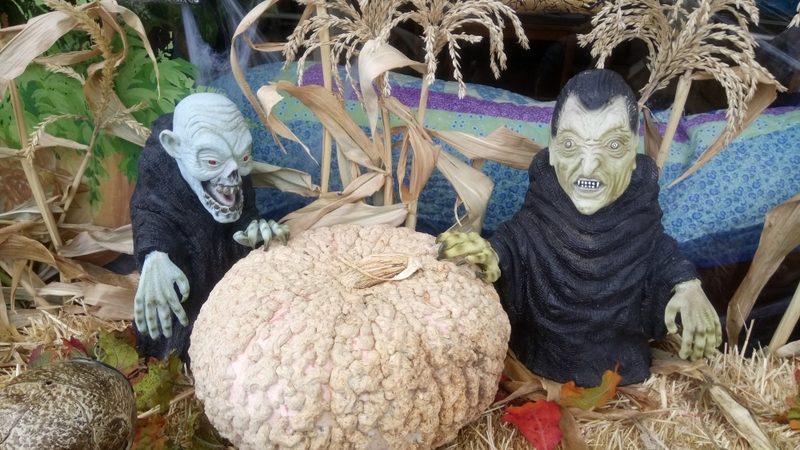 They're like a tiny, undead Statler and Waldorf for pumpkins. 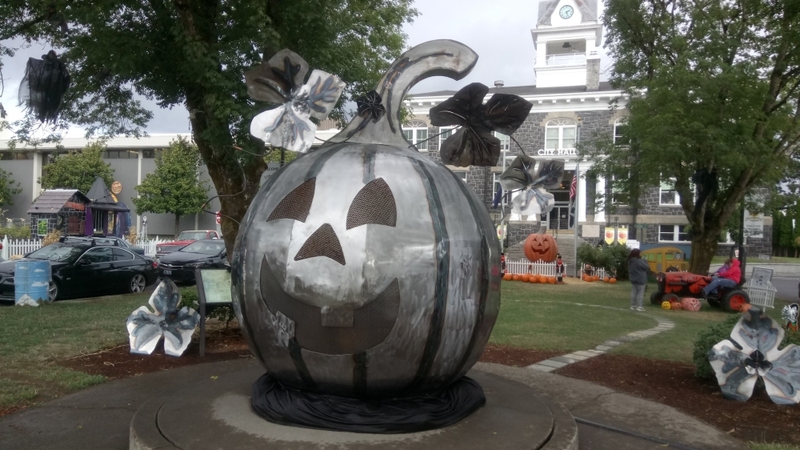 Speaking of pumpkins, the town's center courtyard had this GIANT metal Jack O' Lantern sculpture that quite possibly lights up at night, but looks just as nice glinting in the gloom of this perfectly cloudy, sometimes rainy day. 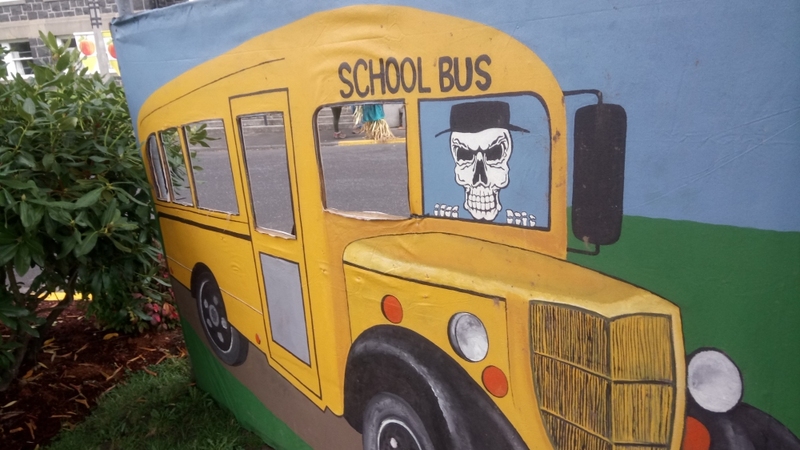 If we were so inclined, we could have had our pictures taken in a schoolbus terrifyingly driven by a dead skeleton who is not paying any attention to the road. Only the fact that we all dislike our own faces, let alone showing them to the internet, saved us from this almost certain doom. 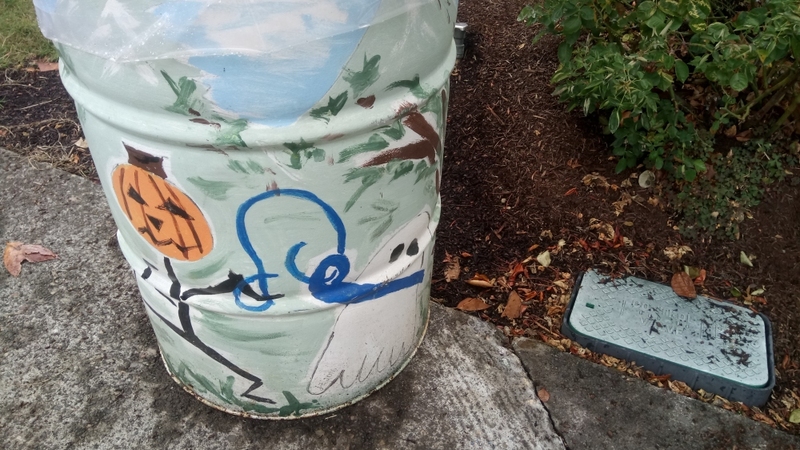 Even the trash cans around town were decorated, seemingly as a project by local children. This child decided that pumpkin people probably keep human souls on leashes like animals, which is either a whole lot darker or exactly 100% as dark as they thought it was, if I remember what it was like to be a child. 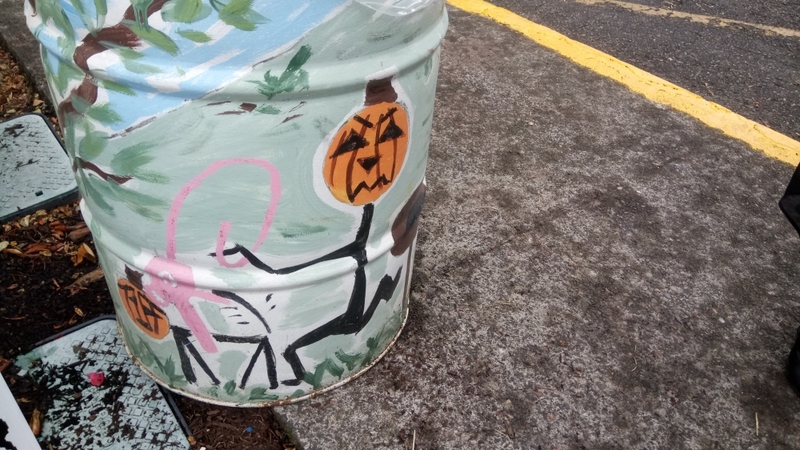 The other side gets even more twisted, with a sad pumpkin person on an angry pumpkin person's leash, unless that one black line is a tail and the first one is a pumpkin dog, though it's still a sad pumpkin dog, which is just going darker and darker. 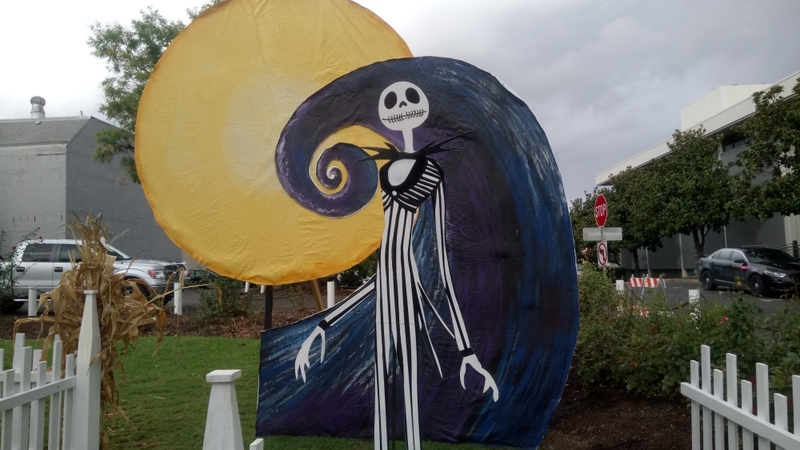 This hand-crafted Jack Skellington standee was also really nice. There were ironically enough few if any displays pertaining to the movie Halloweentown, but when I hear the phrase "Halloweentown," it's The Nightmare Before Christmas I'm more inclined to think about anyway. 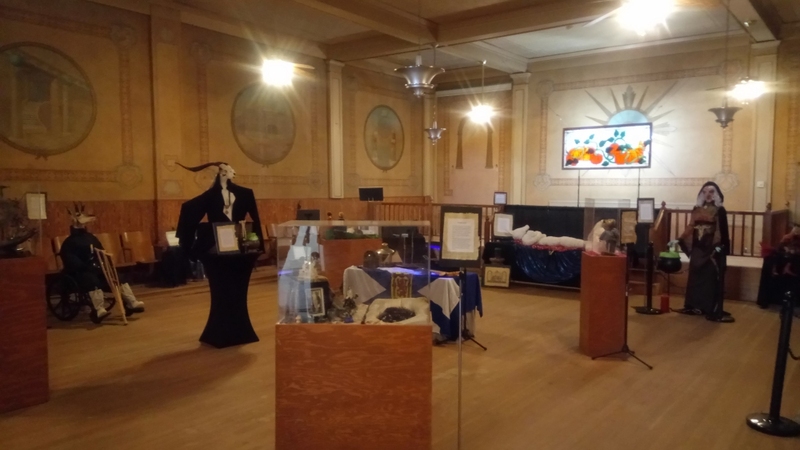 We also had to stop in St. Helen's "Museum of Peculiarities," built inside an old church with a number of fun displays. 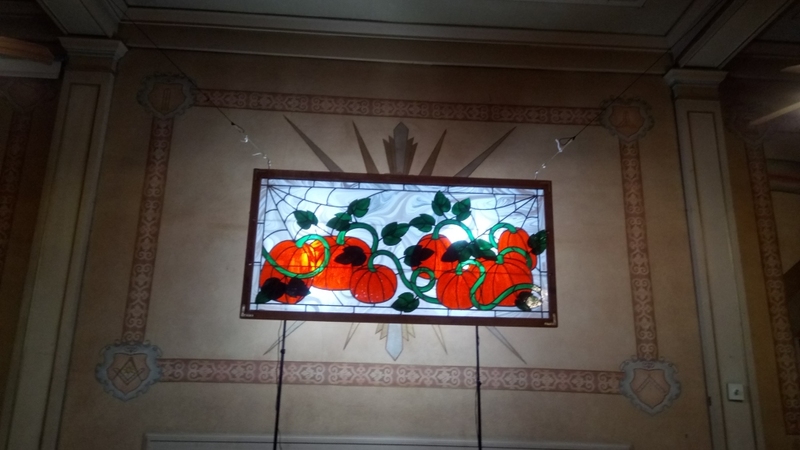 I feel like I don't really want to show off most of them because it would be kind of spoiling a very sweet and modest little sideshow, but its pride and joy seems to be that stained glass pumpkin panel - an actual prop from the Halloweentown movie. It IS pretty nice looking up close, and apparently the only survivor of several similar custom windows. Personally, I just like knowing that a prop from a children's Halloween movie is enshrined in a church like this. 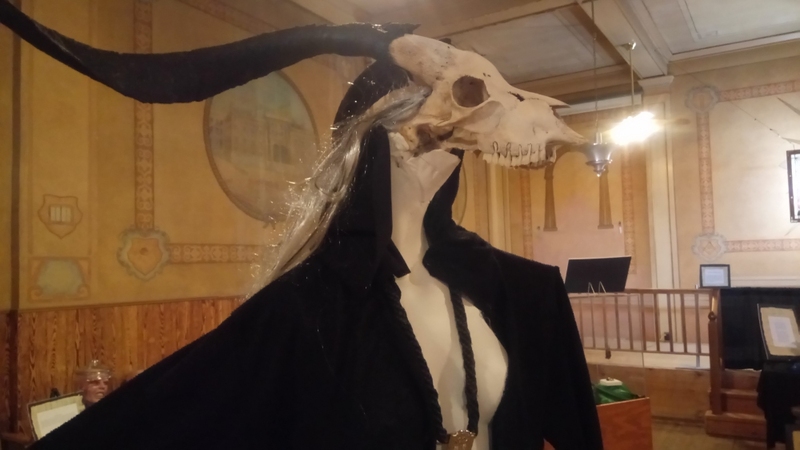 I will at least show you a closeup of this awesome "Djinn," made from nothing more than an old mannequin and an animal skull! What is that? An antelope? I don't know, mammals aren't as much my thing. 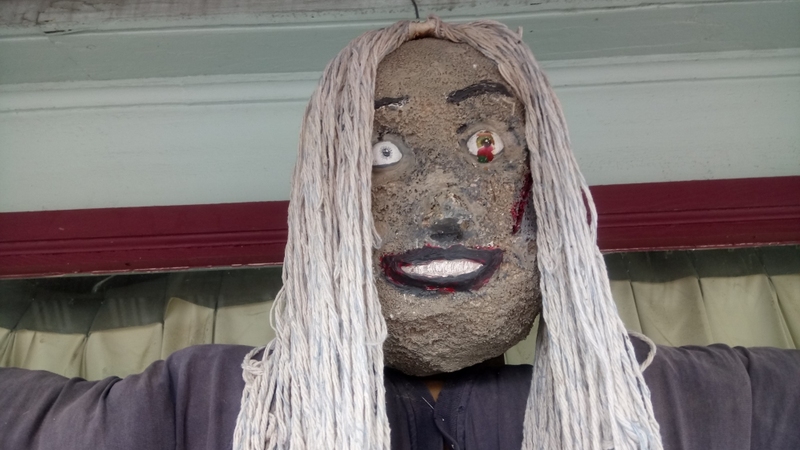 A number of decent scarecrows also littered the sidewalk, but I feel like they might all pale in comparison to whatever this is supposed to be. Let's take a closer look! GOOD LORD. 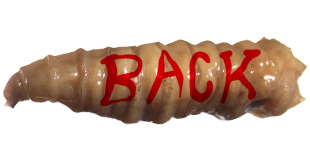 This has all the qualities of something that wasn't really intended to be horrifying, but turned out that way by accident, and I'd usually feel bad about that, but the application of a little fake blood tells me that this thing's creator knew exactly what they had unleashed upon the world. 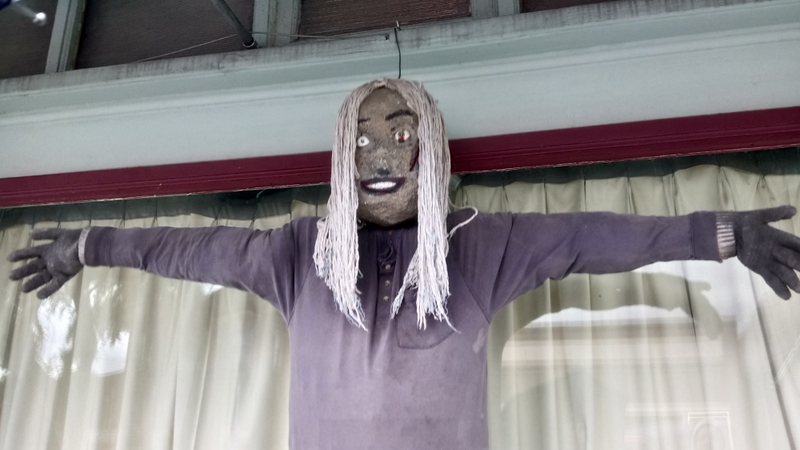 More blatantly monstrous scarecrows only end up cuter and funnier by contrast, and what's not to love about this big-faced Hyde? They only want to help out in the kitchen! At a nearby restaurant, we spotted some umbrella-hocuses for the first time in the "wild." 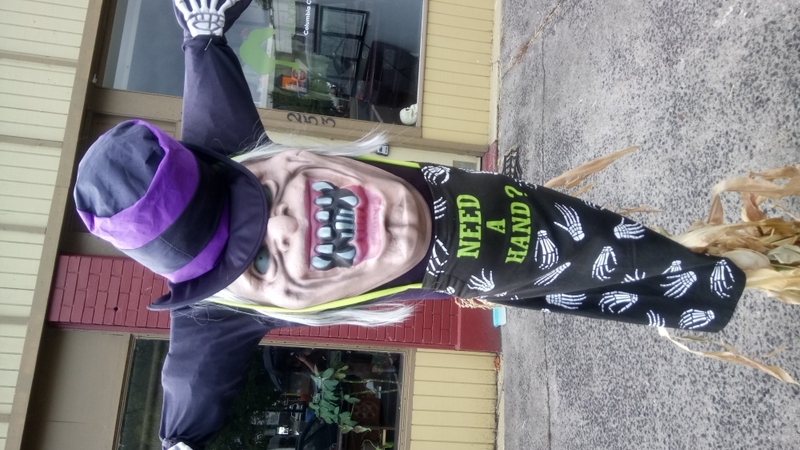 These are an Arts & Crafts project I've seen crop up in a few places this year, our obsession with bodiless witches accidentally producing what is basically our own take on the Japanese Kasa-Obake. 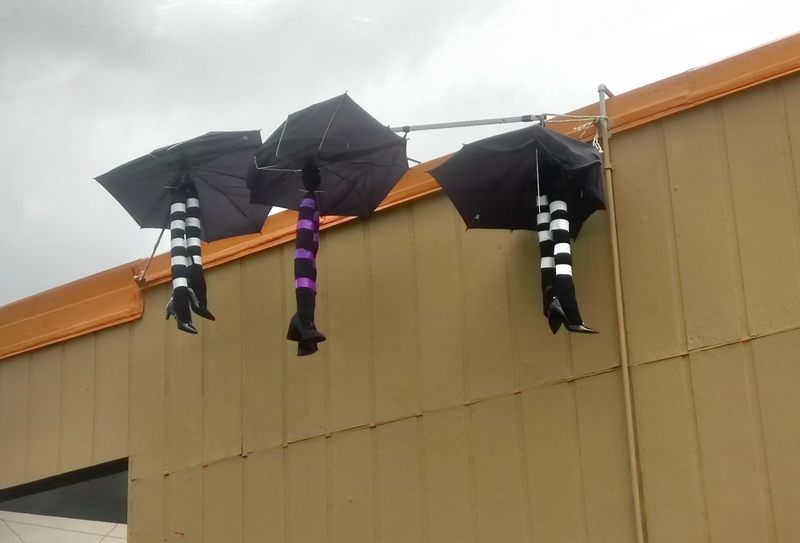 I sincerely hope these things will remain popular and continue to evolve, maybe to the point that we're not just making them from actual umbrellas, but making figurines and toys of umbrella-bodies witches just as we've been doing with the hat-bodied variety. 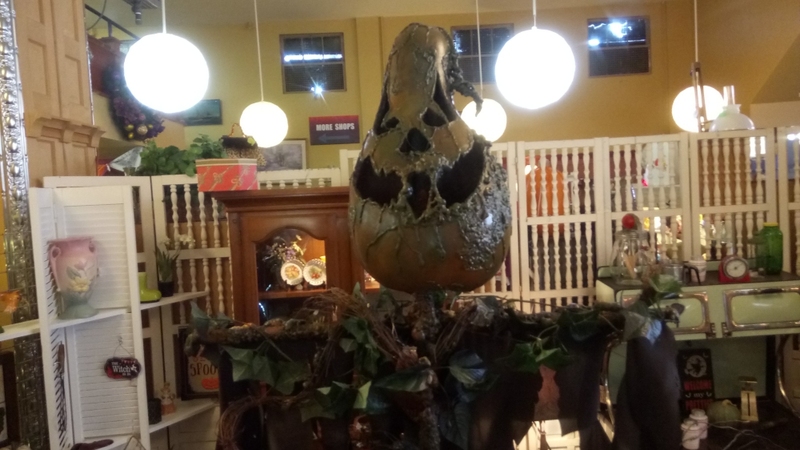 One of the best things we saw in town was actually the gigantic, two-story antique store with all sorts of holiday goodies scattered throughout, but none as impressive as this huge, custom-made "rotten pumpkin" scarecrow on sale for only a couple hundred dollars. One vendor, as I do believe this was a multi-vendor antique store, was offering this ancient mechanical skeleton band whose only lyrics are "GET DOWN...HALLOWEEN!" It's not the most imaginative song, no, but it basically says everything any song should ever really need to say about life. In one particularly odd corner of this store, we ran into an incredibly obscure Burger King(?) 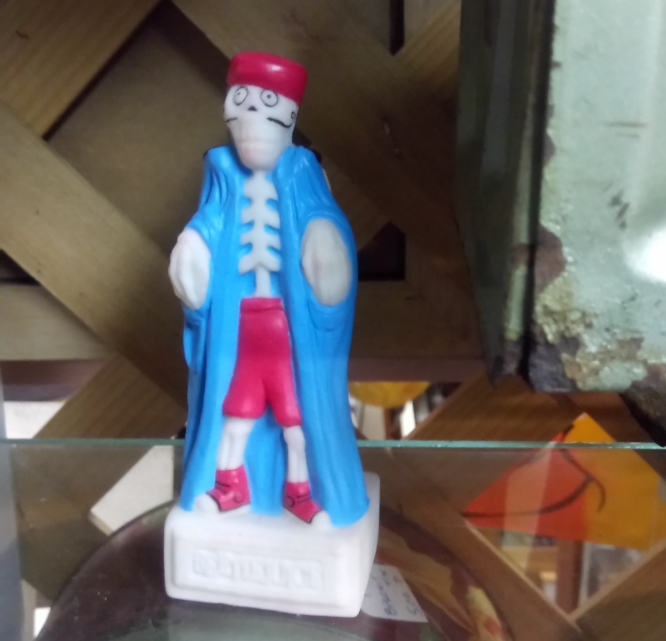 toy of Jacques La Lean, the fitness-obsessed skeleton from the Beetlejuice cartoon series! As some of this show's only surviving fans, this would have been pretty exciting, except I already found and bought this exact same thing for my Spouse only months ago. I guess, in retrospect, we should have bought this second one so we could just have two Jacques on the same shelf, like ineffectually small and lightweight bookends. I knew we had found someplace special when I stumbled upon this, though. 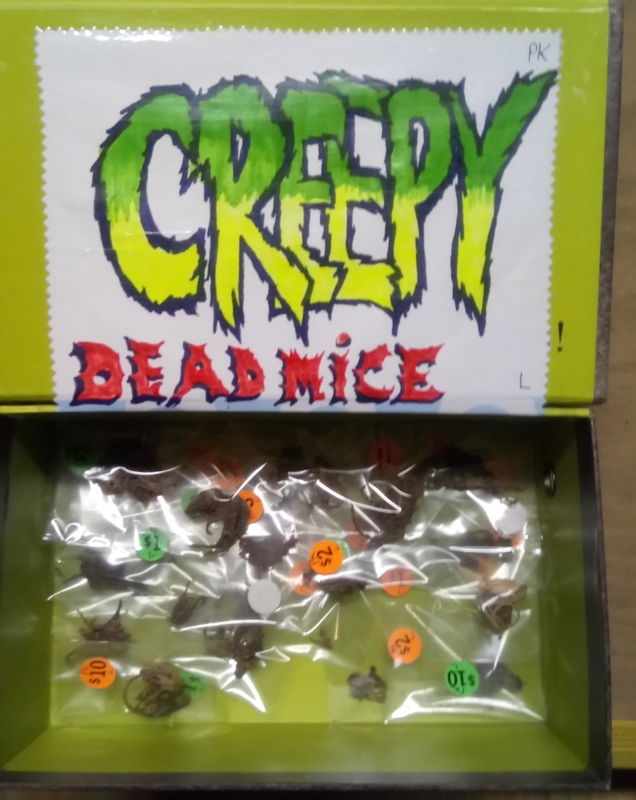 How many antique stores have you been in with a giant, bile-green box of "CREEPY DEAD MICE" for sale??? From the looks of things, these are definitely not just unsuspecting, innocent mice murdered purely in the name of antiquing. 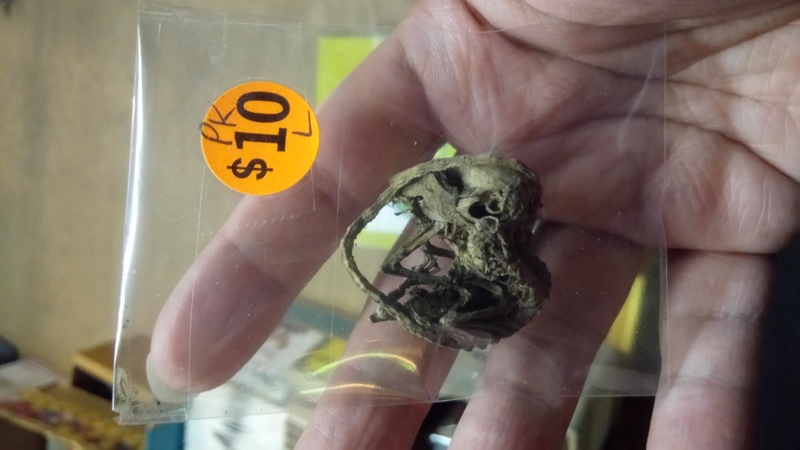 These are the kind of ancient rodent mummies you can find for yourself in neglected enough buildings, sometimes when opening up the walls or floors of a home that, in ages past, may have sicced an exterminator on the poor babies. There's no sense letting their mummifies remains go to waste, I mean, obviously they're not using all these bones and tissues anymore. You really may as well put them in a box on the floor under a table where virtually no-one is ever going to look and slap some price stickers on them for that one person out of a thousand who will actually notice them and be dumb enough to spend money on a decomposed rodent. I bought two! And the lady up front put them in an old Chinese takeout box for me! 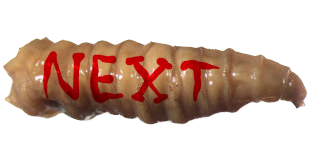 This stop motion short by the semi-legendary Webster Colcord originally played only at a select few animation festivals and, I believe, during breaks on MTV when it was still a daring, experimental hub of underground art and music back in the early 90's. 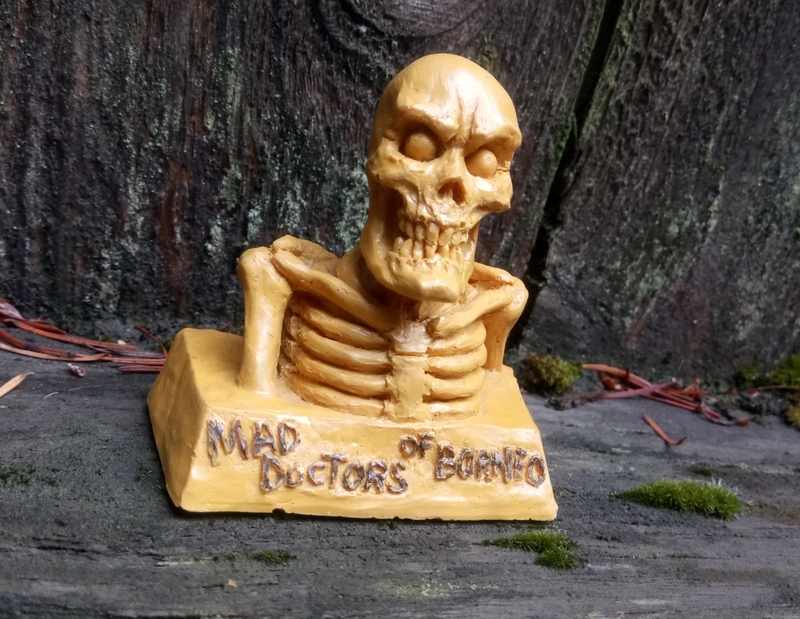 There is positively no mention on the internet of any "merchandise" being made of these shorts, but the material and quality of our little statuette doesn't feel like a fan-made piece, either. Television and radio networks often made their own "internal" promotional merch handed out basically only to higher-ranking employees or potential investors, so it seems likely that's what somehow, some way, found itself at an antique store in St. Helens and subsequently in our bedroom between a blown glass housefly and a plastic Baikinman.